The TVS Scooty Zest 110cc has become the first 110cc scooter to reach Khardungla Pass. Celebrating the achievement is a special edition model called Himalayan ‘Highs’, priced at Rs. 46,113. The mighty Himalayas are a land of adventure for bikers that give them a sense of freedom like no other. Most bikers prepare their motorcycles extensively to take on the adventure. It is quite a bit of news then that for the first time an automatic scooter has made it to Khardungla Pass in the Himalayas. Achieving the feat aboard the 110cc Scooty Zest from TVS was a lady by the name of Anam Hashim, who has entered the record books in India Book of Records for being the first rider to reach the highest motorable road in the world on an 110cc scooter. Over a span of 20 days, Anam Hashim rode from Jammu, via Srinagar, Kargil, Zoji La Pass and over to Leh and Khardung La. Celebrating the feat, TVS has launched a special edition version of the Scooty Zest 110 called the Himalayan Highs edition, featuring a new brown shade, a special emblem honoring the feat, a new tapeset, body colour mirrors and body colour cover switch panels. The special edition TVS Scooty Zest 110cc Himalayan Highs edition is priced at Rs. 46,113 (ex-showroom Delhi). 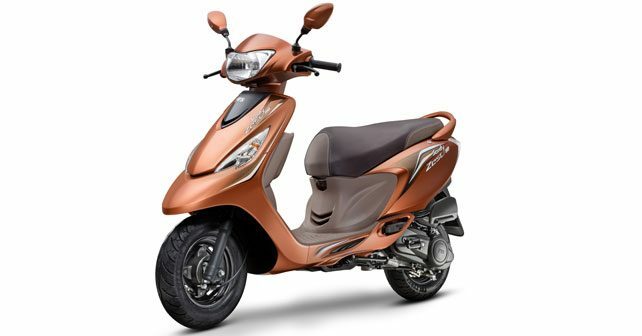 “The Scooty has been an iconic brand for mobility in India. It’s only fitting that the first 110 cc scooter to reach the highest motorable road is a Scooty Zest 110, and it was ridden there by Anam Hashim, a 21 year old Scooty Zest owner. We are happy that this feat has found place in the India Book of Records. To commemorate this historic ride, we are happy to launch the Himalayan Highs special edition. We continue to enhance the ride experience for the new age Indian woman,” said, Aniruddha Haldar, VP Marketing, TVS Motor Company.